Also see Myths & Facts, a document published by the International Sleep Products Association (ISPA) (The Mattress Manufacturers Association). This document was supplied to a TV station and linked from the station's website report on poison mattresses. ISPA severely misstates the facts. Our responses to their statements are listed below each of their "Facts" and are titled "Real Facts." Common sense should tell us there are no natural or chemical free systems that will pass the two-foot wide blowtorch open flame test for 70 seconds. When you look at the table and percent of chemicals used in fireproof mattresses published by the CPSC, you see the basic choices manufacturers have. They all contain toxic chemicals including Boric Acid (Roach Killer), Antimony (an Ancient poison almost identical to Arsenic), Silicon, DBDPO, Fiberglass, Ammonium Polyphosphate, Melamine, and Formaldehyde. All the Boric Acid systems also contain Antimony. Most systems contain Antimony. Kevlar is only used in the thread to hold the mattress together, not the fireproofing system. Even so called inherently fire resistant fibers have toxic chemicals blended into the fiber itself such as Antimony in Modacrylic fibers, Silicon in Visil, and Formaldehyde in Melamine resin fibers. Fiberglass is an inhalation risk by itself, but these systems also contain DBDPO (Deca) a toxin some groups are trying to ban. We don’t think there are any proprietary systems the CPSC doesn’t know about. If non-toxic systems exist, why doesn’t the CPSC point them out? There are no labeling requirements because the CPSC says consumers would not be able to distinguish a safe system. Indeed we can’t either, there appear to be no safe systems, they all have health risks. This chemical use in mattresses is especially risky with our close chronic exposure for our entire lives. If you can pin manufactures down on using chemicals they say Boron, the main ingredient in Boric Acid, is found in plants, fruits, vegetables, and wine, etc. However, these are minute amounts. A Queen Size mattress can contain 1.5 pounds of Boric Acid and a Crib Size a ½ pound. Small amounts of Boron are usually found in compounds such as Borax. Boric Acid is the raw concentrated stuff. It is found in nature in only one place in the world, a sulfur spring in Italy. Boric Acid is made from the reaction of Borax and Sulfuric Acid. Boric Acid is considered the best Roach Killer, and Roaches are hardy creatures. Boric Acid will kill almost all insects and organisms. Manufacturers will say Boric Acid has been widely used in mattresses for 30 years. (They try not to tell you they now also use Antimony, embedded in Modacrylic fibers, to pass the new open flame test) We dispute how widely Boric Acid has been used in comparison to 25 million new mattresses annually. Even so we may have already harmed people and not know it. There are already 6,463 US cases of Boric Acid poisoning each year. With the advent of the cigarette ignition law in 1973 they started adding 10% Boric Acid as fine powder to cotton batting so it would pass the cigarette test. Its use has always been controversial; it has never been studied for safety. Most manufactures moved away from cotton batting because regular urethane foam and polyester fiber batting would pass the cigarette test without added chemicals. Boric Acid treated cotton alone will not pass the new open flame test. Now they must also add Antimony to pass the test. All the Boric Acid flame proofing systems now also contain Antimony. Manufacturers will say there is an infinitesimal amount of Boric Acid at the surface of the mattress. It is blended as lose dust in the cotton batting and is at the surface of the mattress to protect the inner components from fire. 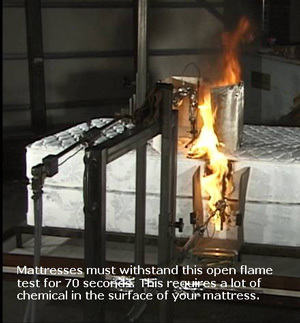 The NIST (National Institute for Standards and Technology) has a shaking machine they use on mattresses to shake out the lose Boric Acid before they fire test it. The CPSC measured the amount of Boric Acid that leaches to the surface. Then the CPSC employee writing the report to justify the regulation assumed we would absorb only less than 1/10,000 of the Boric Acid that contacts our body. The National Academy of Sciences in their study of selected fire retardant chemicals for upholstered furniture in 2000 says Boric Acid does absorb through skin and cause health effects. Plus there are sucking, mouthing, and inhalation risks. They also recommend against using Antimony as a flame retardant because of health and cancer risks. Manufacturers and the CPSC say this chemical use has been studied extensively. There are no scientific studies that say it is safe to sleep in these chemicals. There is only one small report generated by CPSC employees that tries to justify the regulation, and it has many errors, omissions and problems. First they only examined a few of the toxic chemicals used to flameproof mattresses. If you read the highlighted lines and notes on this report on our website you will see they manipulated everything possible to reach a preexisting conclusion. They underestimate how much poison we absorb, overestimate how much is safe, exclude children under age five, and the report fails the independent review. After measuring the amount of toxic chemicals that leach to the surface the CPSC assumes without data that we will absorb only 1/10,000 of the Boric Acid, 1/1,000’s of the DBDPO, and 2/1,000’s of the Antimony that contacts our bodies. With this assumption they say we will absorb .081 mg Boric Acid, .073 mg DBDPO, and .802 mg Antimony, every night for the rest of our lives. They conclude this amount of poison absorption is safe for everyone, except children under age five who they excluded by assuming all these children will sleep on vinyl sheets due to bedwetting problems, and that this will protect them from the toxic chemicals in their mattresses. The independent reviewer complained about many things that the CPSC simply rebutted and ignored. The reviewer complained strongly that they changed the rules of the National Academes of Sciences “Child Sucking Test” to get lower numbers, and then they did not even apply the test to one year old children who the test was designed to protect. Our analysis shows mattresses would clearly fail this test. The independent reviewer complained their assumptions of safe levels of toxin exposures do not agree with other government agencies. For Antimony the CPSC says it is safe to absorb 166 mg daily, while the US Environmental Protection Agency (EPA) says it is safe to absorb only .03 mg, a difference of more than 5,000 times. Even with low skin absorption assumptions the CPSC says we will absorb .8 mg antimony nightly; this is 27 times more poison than what the EPA says is safe. Most government agencies say they can not determine a safe level of Antimony absorption because even at the lowest levels tested there were serious health effects. The CDC reports studies that a single skin application of Antimony kills rabbits, and another that says six to eight skin applications of Antimony Trioxide, the exact form used in mattresses, in a mixture formulated to resemble sweat killed half the rabbits studied. We know we absorb medicines through our skin from small patches. It seems we may absorb much more Antimony than the CPSC predicts. In a 2004 CPSC report the same authors of the 2006 report justifying the regulation state: “Data are needed to determine the conditions for, and potential releases of, Formaldehyde from barriers made with melamine/formaldehyde resin fibers.” They knew about formaldehyde dangers and completely omitted it from their 2006 report. Formaldehyde is serious poison causing blindness and death and is a known human carcinogen. Formaldehyde concentrations of only 10 to 15 parts per million have caused nasal cancer in rats. With our noses next to these mattresses for many years what will it do to us? The CPSC tested mattresses treated with Ammonium Polyphosphate and stated “a substantial amount of Ammonium Polyphosphate was released.” However, they say that since it is not considered acutely toxic or cancer causing like Boric Acid or Antimony under the FSHA guidelines published in 1992, they are required by law to use, they say, “ammonium polyphosphate is not expected to result in any health effects to consumers.” This is apparently the safest choice the CPSC can come up with, but you will never get to choose your poison in mattresses because there are no labeling requirements. We doubt our children chronically absorbing this fertilizer will grow any better. “Comment: Some individuals commented that the "precautionary principle" should be applied to FR chemicals, that is, they should not be used until proven safe. Close chronic full body, mouthing, and breathing contact with known toxins in mattresses for our entire lives is especially risky. It is NOT proven safe to sleep in these chemicals! In twenty to thirty years after we test our entire population we will find out if it is safe. The CPSC says if we find human harm it is up to other agencies to ban that specific chemical. We think it is a little late after we have harmed or killed millions of people to ban a chemical. There are no safe chemicals, only safe use. While you may not be at immediate risk you will replace your mattress within a few years and you, your children, and your grandchildren will unknowingly sleep in toxins for your entire lives.